The Maiden lay athwart the Warrior, her arms widespread as if to embrace him. The Mother seemed almost to shudder as the flames came licking up her face. A longsword had been thrust through her heart, and its leather grip was alive with flame. The Father was on the bottom, the first to fall. Davos watched the hand of the Stranger writhe and curl as the fingers blackened and fell away one by one, reduced to so much glowing charcoal. Nearby, Lord Celtigar coughed fitfully and covered his wrinkled face with a square of linen embroidered in red crabs. The Myrmen swapped jokes as they enjoyed the warmth of the fire, but young Lord Bar Emmon had turned a splotchy grey, and Lord Velaryon was watching the king rather than the conflagration. Davos would have given much to know what he was thinking, but one such as Velaryon would never confide in him. 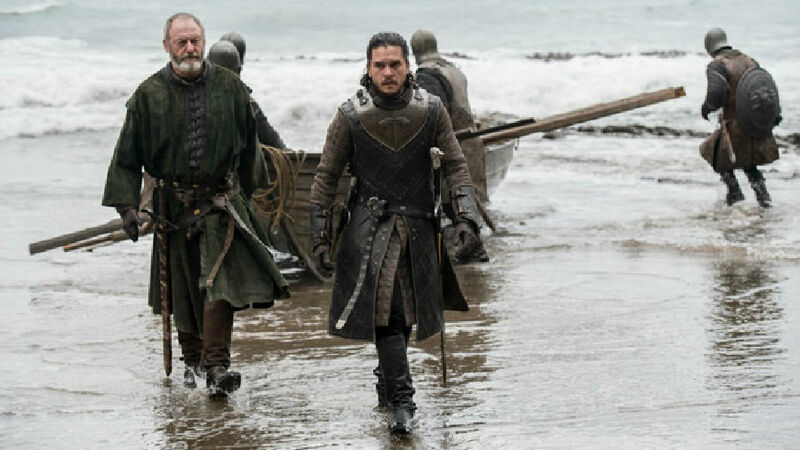 The Lord of the Tides was of the blood of ancient Valyria, and his House had thrice provided brides for Targaryen princes; Davos Seaworth stank of fish and onions. It was the same with the other lordlings. He could trust none of them, nor would they ever include him in their private councils. They scorned his sons as well. My grandsons will joust with theirs, though, and one day their blood may wed with mine. In time my little black ship will fly as high as Velaryon's seahorse or Celtigar's red crabs.